Since that time, I have learned to make December a transition month. Not only to prepare for the new year. 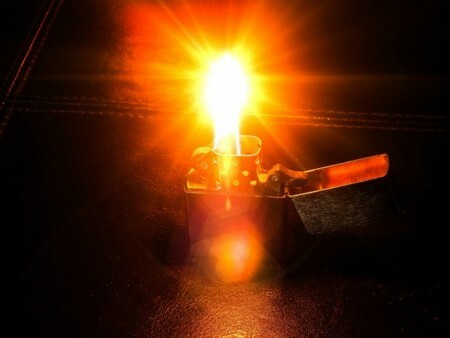 Also to revitalize my spirit and reconnect to the fire within. This article provides you with 3 critical leadership steps for transitioning from the end of this year to 2016. Let’s first address what are transitions. What Are Transitions? 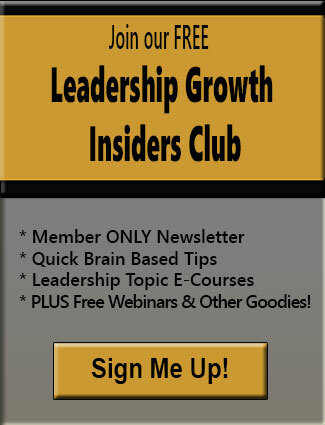 Why Are They Important to Leadership Growth? Think of a transition like the period at the end of sentence. It’s a pause. It ends one sentence and creates a bridge to the next sentence. Transitions are a natural important part of leadership growth, whether you realize it or not. Some are by choice. Some come from natural endings – like the end of a year, the end of a project, etc. The problem is that leaders are often such doers, high initiative individuals, that they ignore or avoid transition periods, even though they are essential to your next level of growth. Leadership breakthroughs can only happen in the pauses. In transition periods. · Provide the needed space for defining new directions in your leadership role. · Reground you to what really matters. Imagine a blackboard cluttered everywhere with writing. Not only will it be impossible to decipher the contents. There will be little room for anything new. The same is true with yourself and your organization. Many leaders start the new year with excessive “energetic clutter” that will hold them back, if not addressed. Below are 3 leadership areas for decluttering prior to the new year. · What projects or goals have you started this year that you neither completed nor are working on? · What communications have you not delivered that needs to be completed– whether it be to a peer, employee, customer, etc.? · What clutter do you need to get rid of or file from your desk, office or email box? · What boundaries do you need to set with difficult customers costing you excessive time, your values (or company values) or resources? · What actions or projects do you need to stop doing and/or delegate to others? · Where are you tolerating underperformance or violations in behavior norms that needs to be dealt with? · What strategies, behaviors, attitudes and/or beliefs that created success in the past are now obsolete and blocking your future leadership growth? · What things this year did you want to be that you’re not being? · What things did you want to do or start that you’re not doing? · What things did you want to change that you’re not changing? · What things have you done yet not acknowledged yourself for doing them? December is a natural transition time to complete, eliminate or take inventory and action around current leadership “clutter” areas. Whether you realize it or not, the unresolved past will not only weigh you down and undermine your leadership performance. It is also the biggest contributor of your current stresses, internal conflicts and lack of motivation. Whether it’s 20 minutes a day till end of the year or taking larger blocks of time away from the office, answer the above questions to start the new year clear, rejuvenated and at the top of your game. With each new year, leaders take time to look at their individual and organizational goals and visions. There are many positive benefits to doing so. Where most such efforts fail or are ineffective, however, is in 2 areas. 1. Visions and goals are often extrapolated from the past and/or present (the known), rather than created from the future (the unknown). 2. Developing visions and goals is often a forced intellectual exercise, rather than a creative, passionate and emerging exploration of new possibilities. You will know you are ready for Step 2 when you feel connected to the part of yourself that knows your destiny. When your mind’s eye starts to give you images, sounds and feelings of the leader you are about to become. True visions emerge. They pull your energy forward. They are neither forced nor what you expect. Your old way of being as a leader will simply seem wrong. You are giving birth to a new vision of yourself as a leader. To get your imagination going, fill out the matrix below for the new year as sequenced as follows. Think in terms of behaviors, attitudes, beliefs, qualities, accomplishments or whatever else is important to you for the new year. Example: You don’t want to unethical and you currently are not unethical. Lower Right Quadrant: What you don’t want yet have. These are the things you want to eliminate or let go of. 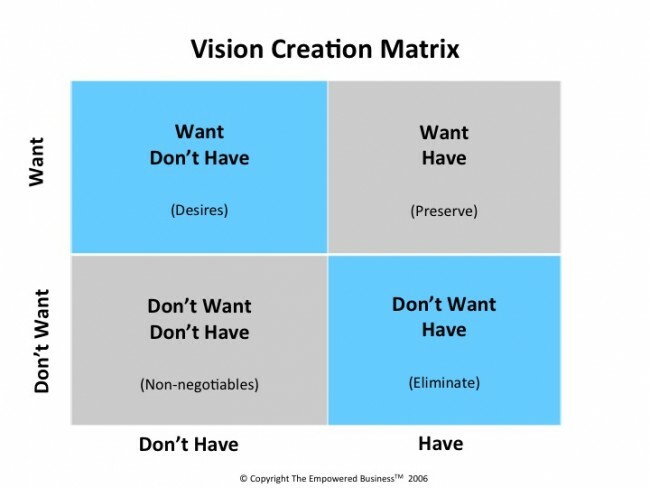 The trick with this quadrant is to convert all the “don’t wants yet haves” to their opposites (or what you do want instead). Why? Because the brain reinforces the very thing you no longer want. The brain is unable to process the word not. Example: You don’t want stress yet you have it. So what’s the opposite of not wanting stress? That is, what do you want instead. Peace? Calmness? Focus? Centeredness? Incorporate these opposites into the last quadrant (want/don’t have). Upper Right Quadrant: What you want and have. These are the things you want to keep/preserve. This is your gratitude list. Example: I want to start my day with a plan and am currently starting my day with a plan. Upper Left Quadrant: What you want yet don’t have. These are your desires. Your BHAGs (Big Hairy Audacious Goals). Example: I want to have strong accountability in my organization yet don’t currently have it. Once you have filled out this matrix fully, imagine what your days will be like in the new year, having what you want (and eliminating what you don’t want). This is a critical step. Write out your new leadership story in present tense. It should start with the words … “It is now December 30, 2016. I am/have … (then write your new leadership narrative). Step 3: Testing for 100% Congruency. At this point, you have completed all your unfinished business from the past year and have written a new leadership vision for 2016. However, you are NOT done yet. In my experience of working with leaders, Step 3 is the most critical (to realize your new goals and vision) yet rarely done. You had your foot on the brake and accelerator at the same time. Below are some questions to test for 100% congruency. · What might you lose if you achieve your vision or goals? · What are the possible benefits or secondary gains of not realizing your vision? · What might achieving your vision cost you? Is it worth the cost? · On a scale of 1-10, how strong is your belief that you will achieve your vision? Or that you have the capabilities to achieve it? · Do your new leadership goals conflict with other goals in your life? Without 100% congruency, your leadership vision will not only NOT be compelling. You will unconsciously sabotage yourself from not achieving it. Is that what you really want? Bottomline: Take time in December to follow these 3 steps to prepare for a groundbreaking new year in your leadership growth. If you find yourself stuck in the process, click on the box in the right margin and sign up for a complimentary Leadership Strategy Session. I have only 3 openings in December. Sign up before it’s too late! Posted by Denise Corcoran on December 9, 2015 in Emotional Mastery, Goal Achievement, Leadership Performance, Mindset, Motivation and tagged beliefs, conflict, congruency, emotional state, imagination, inner leadership game, mindset, motivation, NLP, vision.